Trichosporon is a yeast isolated from soil, water samples, vegetables, mammals, and birds. As well as being a member of the normal flora of mouth, skin and nails, it is the causative agent of superficial and deep infections in humans. The genus Trichosporon is non- or weakly fermentative. There is no sexual reproduction phase, but the fungus has a basidiomycetous affinity [462, 1295, 2202]. Trichosporon beigelii is the most significant pathogen in the genus Trichosporon. The name Trichosporon cutaneum has been often synonymously used with Trichosporon beigelii. There have recently appeared new proposals about the classification and nomenclature of Trichosporon spp. by Gueho et al. and later by Sugita et al[928, 2187, 2190]. Their revisions were based on analysis of 26S rRNA sequences. There have been approaches other than molecular techniques to differentiate the newly named species from each other. The revised taxonomy resulted in seventeen species and five varieties. Six of the species were associated with infections in humans. Among the species causing human diseases was Trichosporon cutaneum. Because the type culture of Trichosporon beigelii does not exist and the investigators felt that it was not possible to characterize this species, the name Trichosporon beigelii was excluded and Trichosporon cutaneum was retained. The other five newly named species in this revised classification are Trichosporon asteroides, Trichosporon ovoides, Trichosporon inkin, Trichosporon asahii, and Trichosporon mucoides. Infections associated with each of these species have been described (Please see TABLE in pathogenicity and clinical significance section below). In addition to the newly defined species and varieties, four serotypes of Trichosporon (serotypes I, II, III, and I-III) have been designated. While serotypes I ( Trichosporon cutaneum and Trichosporon mucoides) and II (Trichosporon asahii, Trichosporon asteroides, Trichosporon inkin, and Trichosporon ovoides) included pathogenic species, serotypes III and I-III are not causative agents of infection [462, 928, 1604, 2187, 2190, 2202]. Other species of Trichosporon include Trichosporon brassicae, Trichosporon coremiformis, Trichosporon dulcitum, Trichosporon faecalis, Trichosporon gracile, Trichosporon jirovecii, Trichosporon lowideri, Trichosporon montevidense, Trichosporon muwides, Trichosporon paehachi, Trichosporon pullulans, and Trichosporon sporotrichoides. Importantly, this newly proposed nomenclature has not yet been fully accepted and many authorities still prefer to refer to the previous classification system. The major inquiry is whether this new classification will facilitate any concept or approach in clinical practice. For example, variation in antifungal sensitivity of these new species is extensive  and the new Gueho classification does not explain how the known amphotericin B resistance of Trichosporon beigelii fits into the new scheme . Also, correlation between the molecular typing and conventional identification methods should be studied and validated. A problem exists in correlating all of the data published in the literature with the new proposed taxonomy. A proper correlation would require the reidentification of isolates from previous cases and studies to determine which species these represent in the newly proposed classification. In all probability, most of these isolates will not be available for study for various reasons. See the summary of synonyms and teleomorph-anamorph relations for the Trichosporon spp. Trichosporon spp. are the causative agents of white piedra, superficial infections and invasive trichosporonosis. This fungus has emerged as an opportunistic fungal pathogen. Immunocompromised hosts are particularly under risk to develop invasive infection, which usually progresses rapidly, involving various organs and systems, including the lungs, kidneys, and spleen. Cutaneous lesions as a manifestation of disseminated infection are also likely. 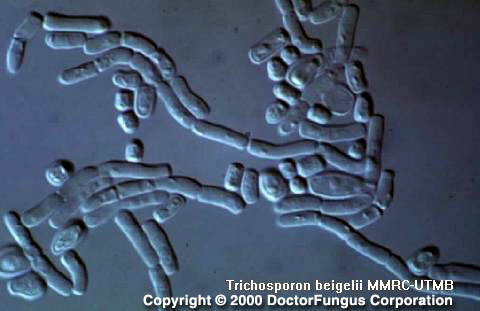 Trichosporon is one of the fungi isolated from patients with fungemia. It may infect prosthetic valves, central nervous system (including chronic meningitis), cornea and the peritoneum (in patients receiving peritoneal dialysis). Benign funguria due to Trichosporon may be observed in renal transplant patients. Disseminated trichosporonosis in immunocompetent host is very rare [66, 238, 414, 428, 462, 556, 716, 732, 741, 910, 967, 1028, 1073, 1145, 1176, 1249, 1250, 1251, 1391, 1449, 1605, 1726, 1963, 2027, 2201, 2270, 2297, 2311, 2364, 2479]. The species-infection associations shown above are general statements, but not absolutes. For example, abscess in the lung due to Trichosporon inkin has been reported . Trichosporon colonies are yeast-like, rapid growing, smooth, wrinkled, raised, folded, glabrous to velvety, dull, brittle, waxy, white, or yellowish white to cream colored. The wrinkled appearance becomes more prominent in time. Heaping at the center of the colony is typical. Urease enzyme production is a significant feature of this genus [1295, 2202]. On cornmeal tween 80 agar at 25°C and after 72 h of incubation, Trichosporon produces abundant and well-developed pseudohyphae and hyphae. Blastoconidia are unicellular and variable in shape. The most typical microscopic feature of this genus is production of arthroconidia. These arthroconidia are unicellular and usually cubical, barrel or elongate in shape [462, 1295, 2202]. Pleomorphic yeast-like cells and septate hyphae are observed. Arthroconidia may rarely be visible . Trichosporon differs from Candida by producing arthroconidia and from Geotrichum by having blastospores [1295, 2202]. In studies so far reported for susceptibility of Trichosporon, the previous nomenclature was used and thus the isolates were referred to as Trichosporon beigelii or Trichosporon cutaneum. In vitro amphotericin B resistance was detected in a number of Trichosporon beigelli strains isolated from neutropenic patients who had disseminated trichosporonosis refractory to amphotericin B. Notably, amphotericin B minimum fungicidal concentrations (MFC) obtained for these strains were significantly higher than the MICs, suggesting tolerance to amphotericin B. The species of these isolates according to the new nomenclature remains unknown. The disseminated course of the disease may suggest the possibility that they were Trichosporon asahii or Trichosporon mucoides . Trichosporon strains with high amphotericin B MICs were detected in other studies as well . Similarly, fluconazole may also yield relatively high MICs for some Trichosporon isolates [1573, 2226, 2276]. Itraconazole and posaconazole MICs are relatively low [683, 2226, 2268]. Voriconazole appears very active and more potent than itraconazole in vitro [1493, 1494, 2275]. Terbinafine, alone or in combination with azoles, has good in vitro activity against Trichosporon . The MICs obtained for the novel echinocandins, caspofungin, anidulafungin, and FK463 are consistently high, indicating that these agents have practically no activity against Trichosporon isolates [683, 2226, 2276]. Amphotericin, fluconazole, and itraconazole are used in treatment of trichosporonosis [370, 886]. Unfortunately, in vivo efficacy of various available antifungal drugs remains limited in disseminated infections and mortality rate is high . Similar to that in other opportunistic mycoses, improvement of the host factors remain crucial for successful clinical outcome and in vitro susceptibility pattern is not the only factor determining the clinical course. For example, clinical failure in trichosporonosis due to an amphotericin B-susceptible strain has been reported . Nosocomial breakthrough fungemia due to Trichosporon has been observed during itraconazole prophylaxis . Fluconazole or flucytosine combined with amphotericin B was found to be beneficial in treatment of trichosporonosis by some investigators [67, 238]. In localized cutaneous infections, surgical debridement may be indicated as well as antifungal therapy.